Chantiers jeunesse is a non-profit organization created in 1980 to promote the development of young, active and engaged citizens while fostering community development. To promote the development of young, active and engaged citizens while fostering community development. Through our projects, youth increase their potential and gain new skills while discovering a new country or region. Our initiatives reflect an international trend that mixes business with pleasure. 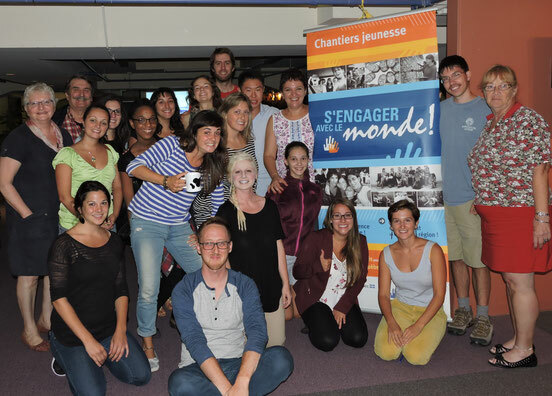 Chantiers jeunesse is helping create a supportive community with a global worldview. Through its projects, we help young volunteers and communities reach their full potential. Our initiatives reflect an international trend that includes individual and collective needs in the development of each project. We organize volunteer projects in different regions of Quebec for youth aged 15 to 30 and monitor Canadian participants that we’ve put in international projects (more than 35 possible destinations in Europe, North America and Asia). Every year, 150 young volunteers are involved in different projects initiated by Chantiers jeunesse. All of this is feasible thanks to our collaboration with some forty international organizations who are also part of the Alliance of European Voluntary Service Organisations. Workcamps have existed for almost a century. The idea started in France during the 1920s, just after World War I. At that time, the goal was not only to rebuild devastated villages, but also to show that international cooperation was still possible and could help restore world peace. Over the years, a workcamp has become an educational project that contributes to participants’ personal and social development as well. A trained engineer, Stéphanie has been deeply involved with Chantiers jeunesse for the last ten years. Her daily dedication for civic engagement, environment and surpassing oneself transpires in her work and volunteerism as she has participated in numerous local and international volunteering projects. For Annie, “Every single step counts,” and she has walked a lot, from Charlevoix to Ho Chi Minh with a stop in Mali! Throughout her journey, she took a particular interest in project development and entrepreneurship. Wherever she goes, she is passionate about humans, and takes pride in guiding them towards their goals. A high interest in youth civic engagement and in international cooperation is what brought François to Chantiers Jeunesse. With a background in tourism and cultural work and motivated by numerous memorable international experiences, he works hard to pass on this sense of commitment and intercultural sensitivity to the future volunteers. With an appetite for travel and adventure, Guillaume likes to meet new people and learn about cultures. From France to Quebec with a stop in British-Columbia, he helped a lot of young people take part in volunteering projects in their local community and abroad. It is from Toronto that he works to allow more youth get involved and live an unforgettable experience. Driven by a natural curiosity and a great sense of adventure, Valerie has visited a few corners of the world. Trained as a teacher, she is eager to help volunteers pursue their ideas and make the changes they would like to see in the world. To learn more about the mission, evolution and efforts of Chantiers, we invite you to read our annual report. Only available in French.